With a stay at OYO 9235 Hotel Nayyar in Amritsar, you'll be within a 15-minute drive of Golden Temple and Hall Bazar. This hotel is 0.7 mi (1.2 km) from Gandhi Gate and 0.8 mi (1.3 km) from Partition Museum. At OYO 13365 Hotel Teg Royal, enjoy a satisfying meal at the restaurant. A complimentary continental breakfast is served daily from 8 AM to 9 AM. OYO 1662 Hotel Behl Regency is situated in Amritsar, 8 km from Golden Temple. The property is located 8 km from Durgiana Temple, 8 km from Jallianwala Bagh and 7 km from Narula's Mall. The property is set 7 km from Partition Museum and 7 km from Punjab State War Heroes' Memorial & Museum. At the hotel, every room is equipped with a wardrobe. The private bathroom is equipped with a bath or shower and free toiletries. All units are fitted with a TV with cable channels. A continental breakfast can be enjoyed at the property. 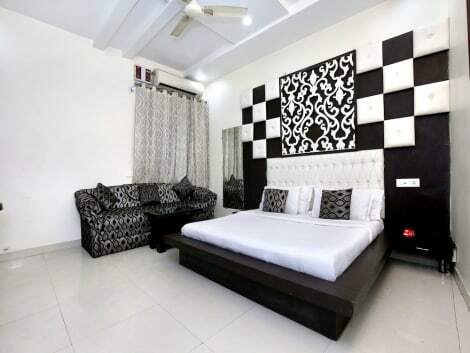 OYO Rooms Chheharta Road offers a terrace. The accommodation can conveniently provide information at the reception to help guests to get around the area. Gobindgarh Fort is 7 km from OYO 1662 Hotel Behl Regency, while Amritsar Bus Stand is 7 km from the property. The nearest airport is Sri Guru Ram Dass Jee International Airport, 15 km from the hotel. With a stay at OYO 1676 Hotel Royal Punjab in Amritsar, you'll be within a 10-minute walk of Golden Temple and Jallianwala Bagh Monument. This hotel is 0.3 mi (0.5 km) from Central Sikh Museum and 0.4 mi (0.7 km) from Akal Takht. Make yourself at home in one of the 25 air-conditioned rooms featuring flat-screen televisions. Complimentary wireless Internet access keeps you connected, and cable programming is available for your entertainment. Bathrooms with showers are provided. Conveniences include ceiling fans, housekeeping is provided on a limited basis, and rollaway/extra beds (surcharge) can be requested. Offering a restaurant and an outdoor terrace, Hotel Sham Villa is located in Amritsar. Free WiFi access is available for all guests. Each air-conditioned room has a flat-screen TV and a fan. Featuring a shower, the private bathroom also comes with free toiletries and slippers. The property offers a 24-hour front desk, and a room service menu. Other facilities offered include a tour desk and luggage storage facilities. The hotel is 6.1 km from Golden Temple, 5.9 km from Jallianwala Bagh and 6.1 km from Durgiana Temple. Sri Guru Ram Dass Jee International Airport is 12 km away. Hotel Heritage Inn is situated approximately 2-minutes walking distance from attractions such as the Golden Temple, Swarna Mandir and Jallianwala Bagh. It offers 24-hour room service and free Wi-Fi access in its public areas. The inn is 2 km from Gobindgarh Fort and Panther Golf Club. It is 2.5 km from Amritsar Junction Railway Station and 15 km from Sri Guru Ram Dass Jee International Airport. Rooms feature cable TV, a mini fridge and a wardrobe. The attached bathroom comes with hot and cold shower facilities. The hotel’s restaurant serves Punjabi delights, alongside other Indian and Chinese dishes. Guests can head to the 24-hour front desk for assistance with luggage storage, currency exchange and laundry services. lastminute.com has a fantastic range of hotels in Amritsar, with everything from cheap hotels to luxurious five star accommodation available. We like to live up to our last minute name so remember you can book any one of our excellent Amritsar hotels up until midnight and stay the same night.